Pakistani Women: Is it premature to celebrate International Women’s Day? Definitely not! Today is International Women’s day, I am in Pakistan, and women are cheering – at least those I have spoken to. ‘What is there to celebrate?’ I ask. Only a week ago Pakistan’s Sharmeen Obaid-Chinoy won her second Oscar for her documentary on honor killing. ‘Precisely for that reason,’ they tell me, ‘and more’. 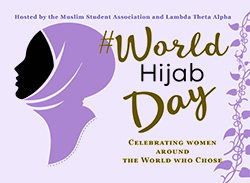 World Hijab Day - What about Me?